Flow cytometric analysis of A-204 cells using BiP (C50B12) Rabbit mAb (PE Conjugate) (green) compared to concentration-matched Rabbit (DA1E) mAb IgG XP® Isotype Control (PE Conjugate) #5742 (blue). 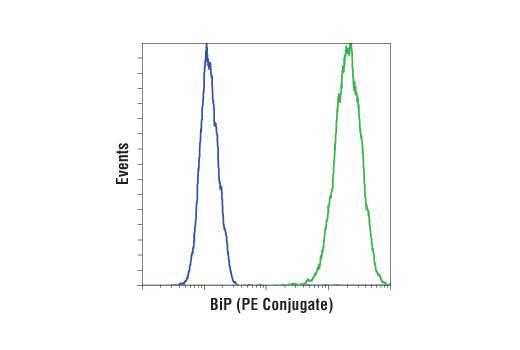 BiP (C50B12) Rabbit mAb (PE Conjugate) detects endogenous levels of total BiP protein. BiP (C50B12) Rabbit mAb is produced by immunizing animals with a synthetic peptide corresponding to residues surrounding Gly584 of human BiP protein. This Cell Signaling Technology antibody is conjugated to phycoerythrin (PE) and tested in-house for direct flow cytometry analysis in human cells. The antibody is expected to exhibit the same species cross-reactivity as the unconjugated BiP (C50B12) Rabbit mAb #3177. Secretory and transmembrane proteins are synthesized on polysomes and translocated into the endoplasmic reticulum (ER). Inside the ER, these proteins are often modified by disulfide bond formation, amino-linked glycosylation and folding. To help proteins fold properly, the ER contains a pool of molecular chaperones including BiP. BiP was identified as an immunoglobulin heavy chain binding protein in pre-B cells (1,2). It was also found to be induced at the protein level by glucose starvation (3). When protein folding is disturbed inside ER, BiP synthesis is increased. Subsequently, BiP binds to misfolded proteins to prevent them from forming aggregates and assists in proper refolding (4). Munro, S. and Pelham, H.R. (1986) Cell 46, 291-300.